MailEnable Standard 6.7 (3.3 MB) is a software used to provide messaging, collaboration, and cost-effective mail services for thousands or just one server. Features include Outlook integration, Mobile Sync, iPhone & iPad calendar/contacts, etc. 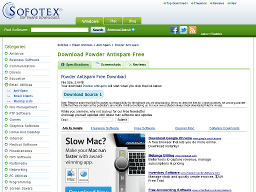 Freeware for Windows 2K/ XP/ Vista/ 7. Contacts Sync 2.2 (497 KB) synchronizes your contacts between Outlook and Gmail. Sync your Outlook contacts to your Android phone, iPhone, Playbook; schedule syncs, etc. Freeware for Windows XP/ 2003/ Vista/ 7/ 2008. Streak is a Customer Relationship Management (CRM) app for your Gmail account. You can group emails from the same source, selectively share emails with others, schedule emails to send at a later date, etc. Requires Google Chrome. Powder AntiSpam Beta (2.4 MB) for Outlook 2003/2007 deletes all non-solicited mail from your mailbox without any configuration. No personal email is ever deleted. 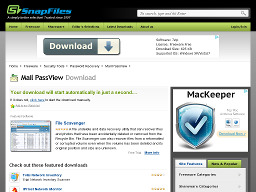 Freeware for Windows XP/ Vista. Mail Them Pro (938 KB) is a mass mailer and mailing list management application. It has a high performance built-in SMTP server, but you can also send email through your ISP at incredible speed. Other features include mail merge, automatic handling of subscribe/unsubscribe requests and bounced messages, HTML mail delivery and support for file import from Access, Excel, MS SQL Server and Windows Address Book. Shareware: $69.95. For Win95/98/NT4.x/2000/XP. 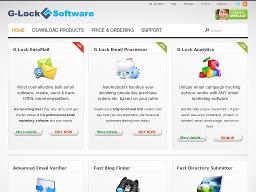 G-Lock EasyMail (2.6 MB) is a powerful group mailer which sends your message directly from your outbox to the recipient's mail server (without using any ISP's SMTP server). It gives instant confirmation of delivery by checking the address before it sends and can also give you confirmation that your message has been read. Features include a message editor, mail merge, fast & easy voice recording, easy-to-use address book, import and export of address book, multi-language spell checker and more. For Windows 95/98/ME/NT/2000. Reg. version $39.95. OutlookStatView 1.10 (83 KB) scans your Outlook mailbox and displays stats about the users that you communicate with via email. Info displayed includes: number of outgoing and incoming messages, the total size of messages sent, email client software used, and the time range. Freeware for Windows 2000/ XP/ Vista/ 2003/ 2008 and any version of Outlook. MSGTAG (1.1 MB) alerts you the moment your email message is opened and details when the message was sent, when it was viewed, and the delay time between sending and reading. 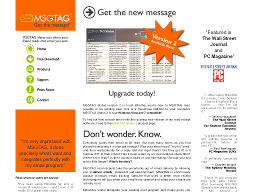 MSGTAG works with almost all e-mail clients including Outlook, Incredimail, Outlook Express, Eudora, and Netscape. All the recipient sees is a small MSGTAG footer. Freeware. For Windows 98/ Me/ 2000/ XP. 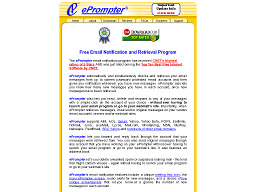 ePrompter (681 kb) is a free e-mail notification program that automatically checks up to eight password-protected e-mail accounts for AOL, Hotmail, Juno, Netscape, USA.net, Rediffmail, Yahoo, POP3, and 100's of other e-mail domains--simultaneously. Features a primary message screen, a unique rotating tray icon, and a a screensaver that lets you know the no. of new messages in each of your accounts and gives you the ability to read and/or delete each message online or offline with the click of an icon. An audio prompt alerts you to new messages. Mail PassView 1.7 (125 KB) provides the username and password for all email accounts supported on your computer (i.e. Windows Live Mail, Outlook Express, Microsoft Outlook 2000-2007, Windows Mail, IncrediMail, Eudora, etc). Freeware for Windows 98/ 2K/ XP/ 2003/ Vista/ 7. 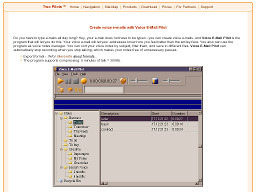 Voice E-Mail Pilot (1.2 MB) can create voice e-mails. The program supports compressing: 5 minutes of talk takes up about 300K. Use the program for email or as a voice notes manager. Automatically stops recording when you stop talking. Freeware for Windows 9x/ ME/ NT4/ 2000/ XP. NetMail (4.6 MB) is a free email-client program that provides support and admin features to assist in managing multiple email accounts. It can also import e-mail addresses from any *.txt, *.dbf (DBASE), and *.db (Paradox) files. The "Mail Merge" options let you send personalized messages to multiple recipients. NetMail can also manage email lists, automatically remove duplicate addresses from a list and process unsubscribe requests. For Win 95/98/2000/ME/NT. Backup To Email 2.2 (1.73 MB) provides a fast and secure way to backup your files. 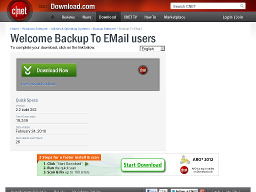 Simply right click on a file or folder to backup to your e-mail account such as Gmail or Yahoo. Features include scheduled daily backups, can zip files and split larger files automatically, etc. Freeware for Windows 2K/ XP/ Vista/ 7. 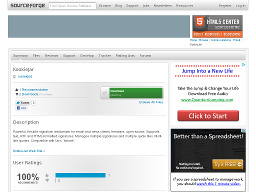 MailList Validator 2.0 (2.3 MB) is an email address validator. Also, determines whether or not certain addresses exist. Freeware for Windows 98 and above. Kookie Jar (1.1 MB) is a tool that generates signatures for use with your favorite email or news program. Signatures can include a random quote or tagline chosen from a file that you specify (samples are included). Apart from an optional random quote, the program can place many other pieces of information in your signature line. Signature layouts can be stored in a special template (sample included). For all versions of Windows.